This has caused several things to happen and made me realise some important things. I could not get past painting red circles so in 2005 I stopped painting for a while. Even when I did n't put the predominent colour on the pallete (actually I use a white plate) the colour still ended up dominating the painting. It was very frustrating. Some times you just have to go with it or change meduim. 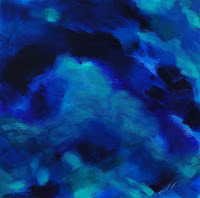 I could not stop painting blue so in 2008 I stopped painting for a while.